It all starts with an idea. Then a design. When you submit your artwork to StickerGiant, your custom Die Cut and Kiss Cut Stickers or Custom Labels take an exciting journey through our factory. 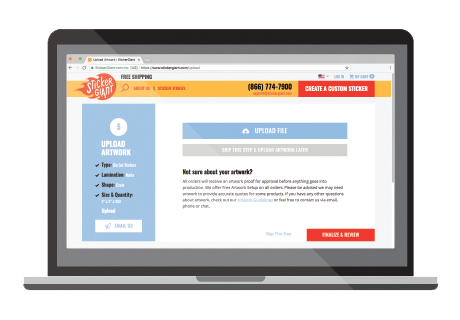 After you send us your art files, our teams get to work, and they do it fast! From our Customer Success Team answering your questions, to our Art Services and Prepress Teams getting your artwork setup to becoming custom stickers or labels, our team works like a well-oiled machine. 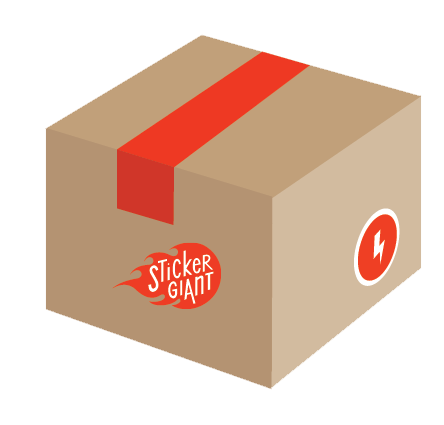 At StickerGiant, we touch every piece of artwork submitted for custom stickers or labels, and offer Free Artwork Setup, so all you need to worry about is uploading your artwork files for us. For the best results, we ask for art files in either high resolution raster or vector formats. You can learn all about the difference between these types of art files on our educational page Raster vs Vector Artwork. After you approve your artwork, it is setup to be sent to the printers, and laser cutting (yep, lasers cut your stickers or labels!). This very important step is how we make sure your custom stickers will be printed, and cut correctly. At StickerGiant most of our custom stickers and labels are printed on a white or clear polypropylene, which is a thin flexible material that is durable for long term use, and thin enough to be easily applied to most surfaces. Your designs are printed onto this material with a digital printing process that utilizes a full color matching system. This means your custom designs can have as many, or as few, colors as you want. Depending on the type of sticker or label you choose, the next step of lamination brings two important qualities. Durability and the finish of your sticker or label. We work with three main types of lamination including, standard, UV, or matte for the perfect finish to your custom sticker or label. We have a lot more details about our lamination options on our Lamination Types page. While the lamination is added to your stickers or labels, our laser die cutters are also at work, We take a modern approach to the traditional die cut when we cut the custom shapes of your stickers or labels. Instead of cutting shapes with custom shaped metal dies that cut the design of your stickers or labels, we do this with lasers. Whether it is classic circles, squares, rectangle bumper stickers, or custom shapes that match the unique designs in your business logo, this is important step makes your stickers or labels uniquely you. If your artwork will become custom Die Cut Stickers, a crack and peel backing will also be added to your stickers in this stage. This is what makes this type of custom sticker so easy to peel and apply. 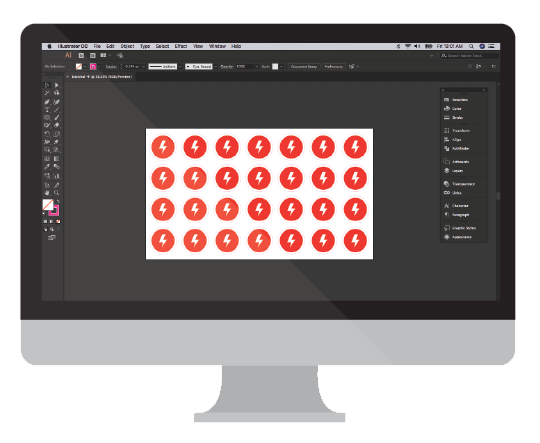 Since stickers and labels are often used in different ways, your labels will be finished on a roll, while any custom stickers are shrink-wrapped in easy to manage stacks for delivery. We add these steps into our printing and finishing process to keep your stickers or labels from shifting too much in shipping, and this keeps them looking great from our door to yours.